Hi there, I was posting as Carola but now we have switched to New Blogger I'm showing up as Knitbert, just in case anybody got confused! 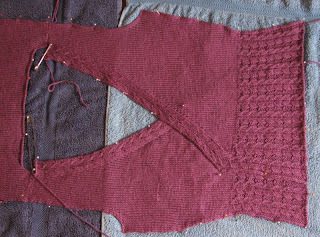 I've finished both the fronts now, and here they are, joined to the back at the shoulders, and blocking. 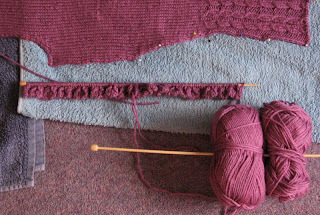 I've started the sleeves, I'm knitting both at once and so far that is working well. 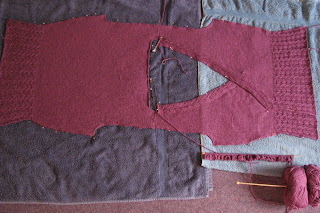 I tried on the fronts and back before blocking and I think it's going to be a good fit and look great! I'm really looking forward to being able to wear my Ivy! Carola, I absolutely love that colour! Such a nice between-colour from pink and purple.